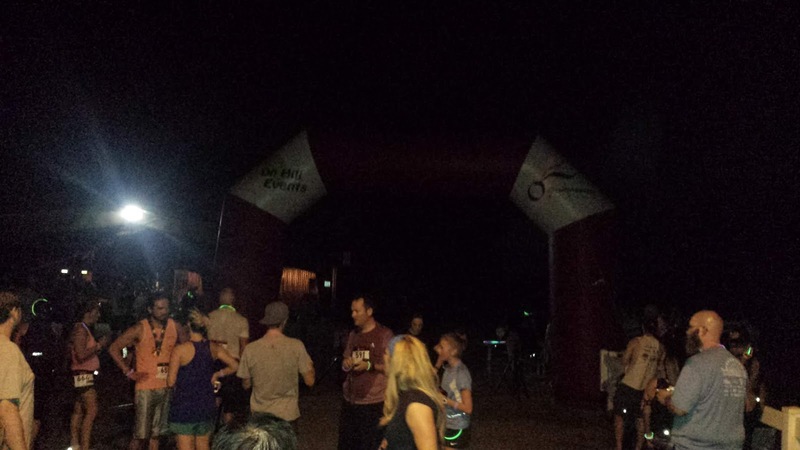 Weather: 85F -- night race with no wind. 3 8:19 Hints of stomach issues. 6 8:29 Pushed it to the finish -- stomach issues be damned. 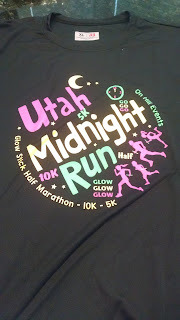 Every summer I look forward to the Legacy Midnight Run. It is held along the Legacy Bike Trail in Farmington. I've run on this bike trail for about a ton of races -- it is ideal for a night race because it is flat, fast and the pavement is in good shape. I just have some many memories (mostly good) about running along here. For this race, I usually do the half marathon every year but after last year's rough race (it was HOT) and knowing that I am not really trained to run a good half marathon, I opted to sign up for the 10K. I thought I'd feel bad for signing up for the shorter race, but all in all, I was okay with it. Normally I sign up for the longest race at any given event and when I haven't, I've beat myself up over not taking the toughest event. Each event though has its challenges. Running a "fast" 5K is just as challenging, rewarding as running 13 miles at an "okay" pace. Call it maturity. I got to the race about an hour early. I seem to recall this race having a LOT more people. 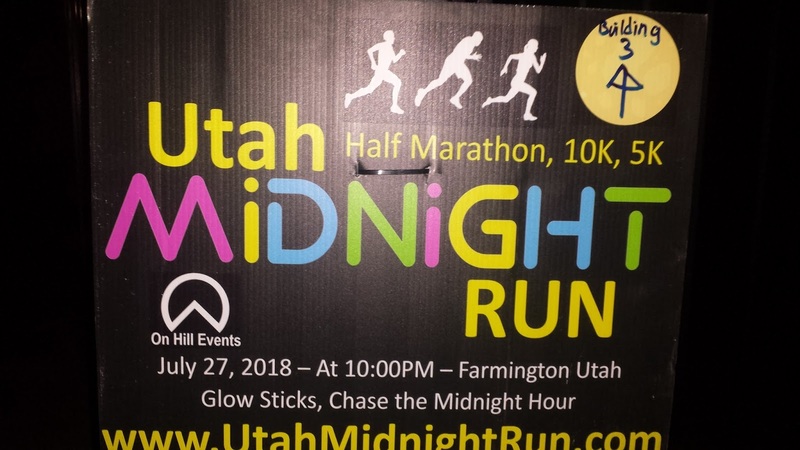 But there were a ton of events in the area this weekend (Spartan / Timp Half Marathon), so I suspect they all cannibalized from each other. 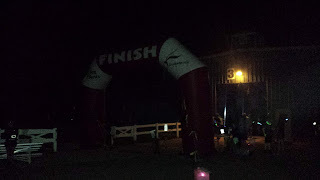 I missed the half marathon start (10 PM) but had plenty of time to spare for my 10K start, which was at 11PM. I had watched what I ate all day and I came to the race sort of hungry but not starving. I think that is good because I certainly didn't want to run fast with food sloshing around. I had pancakes about 4 - 5 hours before the race and a few snacks to hold me over. Since it was 85 degrees I didn't do much of a warm-up... okay I did zero warm-up. Just sort of swung my arms and legs around while waiting for my race if that constitutes warming up. 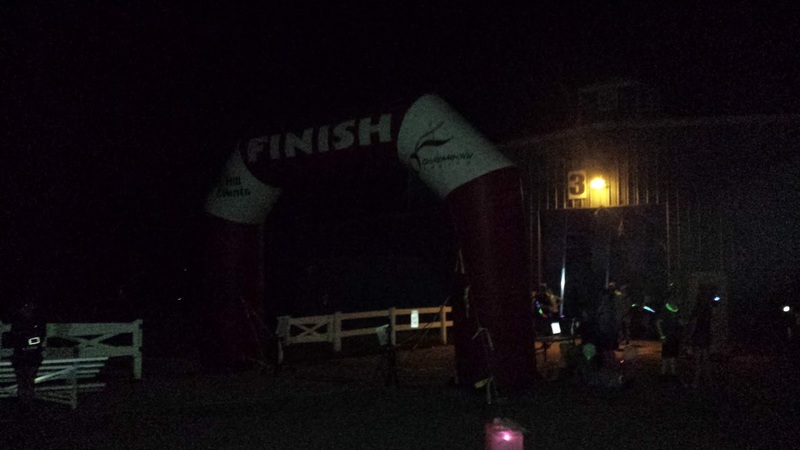 The race started promptly at 11 PM and while it was a chip finish, it wasn't a chip start. Fortunately, I had managed to work my way up to the front. A group of high-school age kids took off and the lead group (about a dozen folks) quickly left me in the dust. I found myself running solo, which is a bit unnerving at 11 PM on a lonely bike trail. The course was well marked.... it was just a little iffy in the first mile where you have to run on a shadowy part of the trail / road and then make your way to the official bike trail. They had a police marshal at the one traffic intersection and I remembered the route from years past so it wasn't a struggle to know where to go. I was working with another guy, who was about 50 - 100 yards in front of me. He had no glow sticks on, so he was hard to see. I wore one around my neck. I always feel it is important to be seen and with 3 races going on (5K, 10K and half) everybody needs to see oncoming people. I also carried a head lamp that I probably used for about 20 seconds (it was a full moon). The first 2 miles I was feeling really good. Although there was a hint of a GI issue coming on: I had to take a nature break. But I was running so well I didn't want to stop. The porta-pottie at mile 1.25 someone had overturned. I told myself if it got "really" bad I could always hit the woods. I was excited to see the turn around point -- the 2nd aid station. It might've been a little short (I got various reports on the distance of the course, from 6.12 to 6.19). I grabbed some ice cold Powerade there and turned around. The Legacy freeway is right next to the route and the headlights approaching me were blinding. 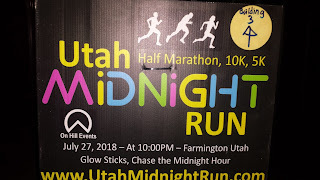 I was wondering what they thought we were doing at close to midnight, wearing glowsticks while running along the bike trail. I was still chasing the one guy who wasn't wearing a glow stick and I got to assess the folks chasing me. There were a few people somewhat close to me but I had a pretty good lead on them. I had gained some ground on the non-glow-stick guy and I figured I could catch him. I hadn't seen too many people who I thought were in my age group though despite seeing a few at the start. By mile 4 and 5 I had to go to the bathroom -- bad. It wasn't an emergency (yet) but it was going to be one soon. I knew I was running a good race and I didn't want to pull off the side and embarrass myself. I had to slow down a bit as a result and the guy I was pursuing was putting me behind him. Finally, I hit the 1.55 aid station (for the 5K turn around). I had gained a little on the guy I was tracking down and apparently he had enough and came to a stop to get a drink and started walking. I rinsed out my mouth with a drink and kept running hoping to leave him in the dust. I thought he was going to duke it out with me but he seemed like he ran out of gas, tried to keep up with me and gave up. I was getting some motivation from outgoing 5K runners. In fact that is what makes this race nice. You pretty much get to see everyone and a lot folks are very enthusiastic about their support. While I am not super speedy it really helped me mentally as people got excited as I was coming back towards the finish line as they were heading out. The last mile or so I was looking over my shoulder to see if anyone was behind me. It was a ghost town and there wasn't anyone in front of me. For most of the race I felt like I was 100% solo. During the last quarter mile, I think a half marathoner blew by me (amazing) or maybe it was a 5K person. Either way, I had secured my position in the 10K and I really turned on the jets at the end to save every second I could. 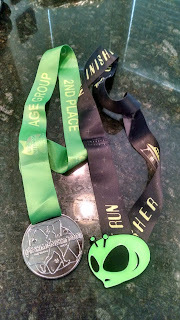 I grabbed my glow in the dark finisher's medal (the alien one above). Kind of felt weird getting a medal for a 10K but that's the way it works these days. The age group medal one has blinking lights as well. They've given those out in years past if I recall. I immediately headed to the bathroom -- which was a pretty good walk from the finish line. I almost got sick in there. Going from top speed to sitting just caught up with me and I admit I was on the toilet dry heaving. Not fun. After I collected myself I went back out and got something to drink and socialize. I felt better once I got something to drink and they had Fat Boy ice cream sandwiches which taste heavenly on a hot night. They started to post results and I noticed my time wasn't up there. Darn it. I am pretty patient when it comes to these things and figured it must be coming. When they were updated again, I still didn't see my results. Turns out my chip didn't register when I crossed. It is a small race and I had proof of my time so getting a result entered in was easy thanks to my trusty Garmin. It seemed to take a while before awards were given out and I think my time wasn't in there for the age group awards so I missed getting publicly recognized (not a big deal). So I had to get that corrected as well. I still got an age group medal and as I write this, I am pretty sure I got first in my age group. Overall, I was pleased with my race performance -- actually tickled pink. I ran really well -- about a minute or two faster than my previous 10K races that I've done. Granted this course may have been a tad short but it was flat, but I felt solid. It was an awesome night for running and there was even some intense heat lightning in the distance (with some cool jagged forks of lightning). I did use beet juice about 3 hours before the race. That may have contributed to my stomach issues. That can be a bit touchy to get down sometimes. I've used it before and every now and then it doesn't sit well. I also had a Subway sandwich for lunch, which might have had too much fiber for me. It is amazing that I've done this race every year since 2012 and it remains one of my favored summer traditions here in Utah. Looking forward to next year.